Donald Trump has been dogged by efforts to undermine his presidency since winning the election in November. Deep State operators and political partisans have been working around the clock to hang a scandal around the president’s neck large enough to ruin him. 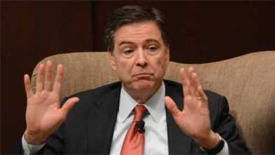 If markets are any indication, they got some help last week from former FBI director James Comey. Comey’s leaked memo asserting the president tried to interfere with the investigation of Michael Flynn, the former National Security Advisor, prompted a selloff in stocks and a boost in precious metals. Democratic Congressman Al Green became the first in Congress to actually call for impeaching the president on the House floor. While there have certainly been plenty of people making the suggestion more informally, Trump’s opponents hadn’t gotten a lot of traction. Now may be the time to start taking the impeachment threat more seriously. There are signs that even some Republicans could support the effort. Representative Justin Amash from Michigan told reporters on Wednesday that if Comey’s memo is accurate, it provides grounds for impeachment. He trusts the former FBI director more than Trump. Meanwhile, there is little reason to expect other prominent Republicans who have often voiced opposition to Trump, such as Paul Ryan, Mitch McConnell and John McCain, will fight very hard to protect the president. To be fair, Trump has done plenty to weaken support amongst his own base. Many perceive him to be filling, not draining, the swamp by appointing a number of bankers and other insiders to key positions. His posture has been much more conciliatory than expected toward Hillary Clinton and other corrupt figures. The president also appears anxious to compromise on key promises such as avoiding further entanglement in the Middle East, repealing Obamacare, and building a border wall. 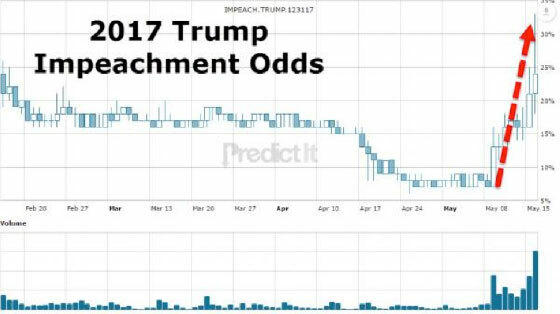 PredictIt, a prediction market where participants can effectively wager on political outcomes, shows the odds of Trump being impeached moving significantly higher. It’s strange that markets, particularly for stocks, continue pricing in the eventual implementation of Trump’s economic agenda. The persistent controversy and the lack of cooperation from Congressional Republicans should have put a dent in investor optimism already. In any event, traders are suddenly more anxious regarding what comes next. The president may survive this latest assault, but his opposition has proven committed to keep trying. There is a growing chance they will eventually succeed. The escalating attacks make Trump likely to respond by going after Democrats, ratcheting up the turmoil even further. There is no shortage of fodder. Last week, for example, new evidence emerged that murdered DNC staffer Seth Rich, not the Russians, was behind leaks of DNC emails. The development drove further speculation that high ranking Democrats had Rich murdered for the transgression. There is also a chance Trump will resort to the favored tactic of governments everywhere for boosting support and deflecting controversy – launch a war. Trump is not known for any ability to quietly de-escalate. The drama in Washington is likely to keep on rising, and precious metals markets may be starting to reflect that.